Space Cadet first class Hugo C. the " space traveler " failed to tell us why capitalism has also wiped out life on Jupiter, Saturn, Uranus, Neptune, and Pluto. Nevertheless, capitalism seems to be doing fairly well on Earth, in spite of the efforts of idiots like Hogo, Fidel, and a myriad of other dolts, all of whom by the way, should be sent into outer space asap. Who would have ever thought that Venezuela would have the first president that gave the world insight about the economic history of Mars? One might argue that the main difference between a sane and a mentally insane person is the capacity to tell the difference between perceptions and thoughts. One thing is to see your neighbor kissing your wife, and a very different thing is to imagine that your wife is cheating on you because she just went to the neighbor's house "to borrow some garden tools". An insane person cannot differentiate between what he has actually perceived and what he has merely "thought" about. For him, his thoughts are reality, not merely possibilities of what reality might be. Chavez's insanity is quite evident in the fact that he shows absolutely no capacity to tell the difference between his perceptions and his thoughts. So the problem with him isn't so much that he's very ignorant (which he is), but that at this point he's isn't even capable of understanding that there should be a difference between the two concepts. damn you got it before i sent you the video!!! I am completeley astonished by the Mars thing...really. ...Would you ever work for such a brutish boss? Some would as your first picture shows. Oh btw, it looks like a bunch of FLEA MARKET swindlers surround a TURTLE dressed in Venezuelan flag. 1,500 liters of water a week would be reduced to 1,000 liters by the time it reaches each home. In SOCIALIST counties, things just went missing when they are in high demand, you know. It is time for Fidel to start a NEW REVOLUTION on Mars. Hope he would meet Che up there. I found it telling that when he mentioned his theory that mars may have been destroyed by capitalism, that laughter came from the audience. Chavez did not share the laughter AT ALL, as though he really believes what he was saying might be a genuine possibility. Lunacy. Well,we have to look at this in a scholarly fashion. The idea that life on Mars was killed off by capitalism requires serious study, I am willing to bet that the US government would give out a multi-million dollar grant to study it. I'm really surprised that this attitude hasn't become an Internet meme yet. Hugo Chavez can do anything. He's an economist. He's an urban planner. He's a psychiatrist. He's an astronomer. Damn, he's even a singer. And all that without any studies. That's the funny part. The sad part is that some people still buy it. No le cumple ni a los panas. Que tal! Ha! I knew you wouldn't stay away from commenting on Mars Attacks! Too juicy. In a country where torrential rains are a hazzard, one would tend to think that they would have designed a system to collect all that water and pipe it to wherever it is needed. Back to Libya for a second. This piece from a chavista "news" outlet shows the (lack of) quality of chavista journalism. It's not just that they make another claim that is simply based on ideology (it may well be true but its pretty clear this is just an assertion, not something they've verified), notice they blame "el FBI." I'm sure they meant the CIA, but the fact that they incorrectly identify the agency that the whole world knows shows how sloppy they are. They say there's no one happier than the village idiot. Please remember there were many capitalists living satisfying lives on Mars. Then came the "Daleks" who said exterminate them. If you have doubts about this ask "Dr. Who". Time to re-write "The Martian Chronicles". Would make a good movie or series with Chavez as the Red Dalek. Re. the students... the things people will do for publicity! The assertions are based on Aristotelian reasoning! First, the observer looks at the earth, and observes that Cuba, Zimbabwe, Belorus, Romania, Bulgaria and other analogous places are in a situation of extended disaster. Obviously, capitalism destroyed these places, as can be ascertained by the psychologically attractive scientific priciple that "la culpa tienes tu." Mars obviously, and maybe Pluto. Go on TV and tell the world! Well, I come from a family that actually wrapped a dying puppy in a 1000 dollar Hermes scarf that was given to us by a French friend, just to keep him cozy and make it easier to hold him...needless to say we value life over fashion. Generally however scarves are bizarre in the tropics.I notice that scarves are used even in the heat by some women who pretend to be sophisticated, and also by older beauties who are trying to hide an aging neck. Well we each have our own ways of projecting our humanity onto the unknown of space.You have your way, my Astronomer grandfather had his, my painter friend has hers, I have my own questing way of enjoying it, etc etc, and Chavez with his PC form of using it for political gain, as he plays his audience( paranoids, fearful ones, and/ or the uneducated) like a fiddle. The plot gets more and more eccentric. I'm thinking we should get Danny Glover, Sean Penn and a few other PSF's and send them to Mars to verify Chavez' claim. On their way, they could check in on our satellite and switch out some batteries and such. What say you? MARTE-POTAZO !! Daniel, si me he podido reir con el título del post. Even CBC radio Canada mentions it today. 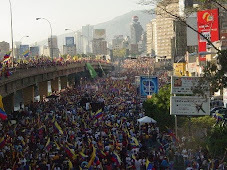 ConsDemo, maybe that FBI is the Frente Bolivariano Internacional. You know, putting themselves at risk to bravely show their solidarity with their Libyan brothers. Bueno Mon Cher, tanto Chavez como tu estan equivocados, no fue el capitalismo que destruyo Marte, fue el SANTO!! Even the Russians wrote about it. Daniel, as a second thought I think that the title of the post is incorrect. Capitalists destroyed Planet Mars and ended up here...jajaja..still LOL. Read the letter of the song in my short post. It reminds me of that. Mars Needs Venture Capitalist Women!